MELVILLE, N.Y. – On February 7th, the top sports photographers from across the country gathered in the San Francisco Bay Area to cover the Big Game between the teams from Carolina and Denver. With more than 70 percent* of the photographers in the San Francisco stadium using Canon EOS DSLR cameras and EF lenses, Canon’s iconic white lenses filled the sidelines from the opening kickoff to the final whistle. “Seeing such a large number of the country’s most talented sports photographers choosing Canon equipment to photograph the country’s biggest sporting event of the year is always such a humbling honor for Canon. 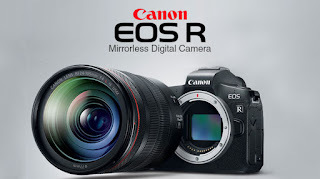 Their iconic images of the game will be seen by millions of people around the world for years to come, and this drives Canon to ensure both our products and support live up to the requirements and expectations of our loyal customers,” said Yuichi Ishizuka, president and COO, Canon U.S.A., Inc. Veteran sports photographers and Canon Explorers of Light Peter Read Miller and Damian Strohmeyer were on the sidelines using the brand-new EOS-1D X Mark II DSLR Camera, the first public use of the camera in the U.S. since being announced to the public on February 1. "The EOS-1D X Mark II is a marked improvement in file quality, and the performance was huge at higher ISO," said Strohmeyer. "This camera is a big step up!" A full complement of friendly and knowledgeable staff from Canon Professional Services (CPS), a fixture at major sporting events throughout the year, were on site at the stadium for the entire weekend providing comprehensive equipment maintenance, extensive equipment loans and expert technical support to the major photo agencies and individual photographers covering the game. "The equipment loan from CPS really gave us some opportunities for our coverage we wouldn't have otherwise," said Carlos Avila Gonzalez, photo/video journalist for the San Francisco Chronicle. "When an event as large and globally renowned as this is in your area, you have to step up to deliver the kind of work that keeps readers and viewers engaged and constantly seeing your publication as the go-to source for visual content. Canon's help with equipment allowed us to provide that kind of coverage." Canon Professional Services will be proudly attending to photographers at over 32 events this year including major sporting, auto racing, Hollywood, and political events throughout the year. 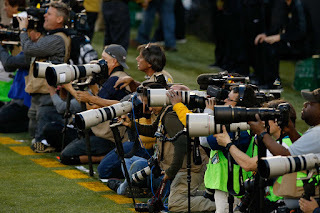 In addition to the lenses on the sideline, Canon’s line of HD broadcast lenses were also used extensively to help deliver the game to more than 110 million television viewers.